It’s late morning and I’m crammed into a tiny corner of my parents’ kitchen, mixing drinks amongst a mess of crushed ice and spilled simple syrup. My dad is by my side prepping waffles, while my mom is doing what she loves most – harvesting vegetables from her garden out back. My mom isn’t much of a drinker, but for Mother’s Day she makes an exception. Especially if berries are involved. Last year it was raspberries; this year, blackberries. I picked some up crème de mûre (blackberry liqueur) just in time for brunch. It’s worth spending a bit more for the good stuff. 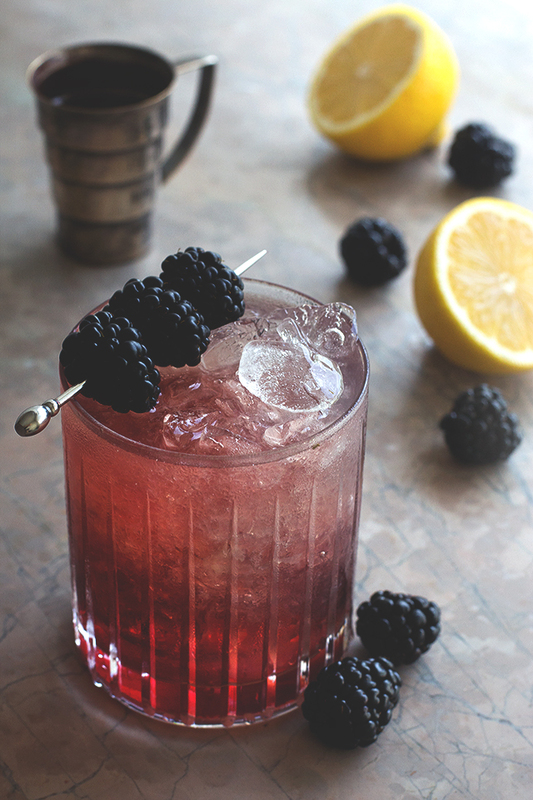 I have a soft spot for simple cocktails, and this classic bramble fits the bill. This one’s for you, mom. 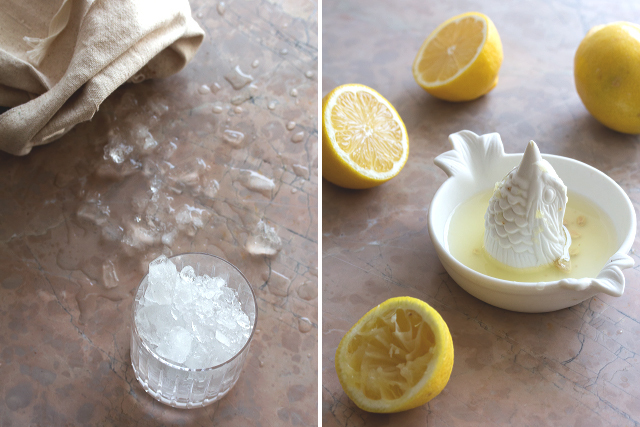 Start by adding crushed ice to your rocks glass. Fill about halfway. Next, simply add the gin, lemon juice, and simple syrup. Stir well to combine. 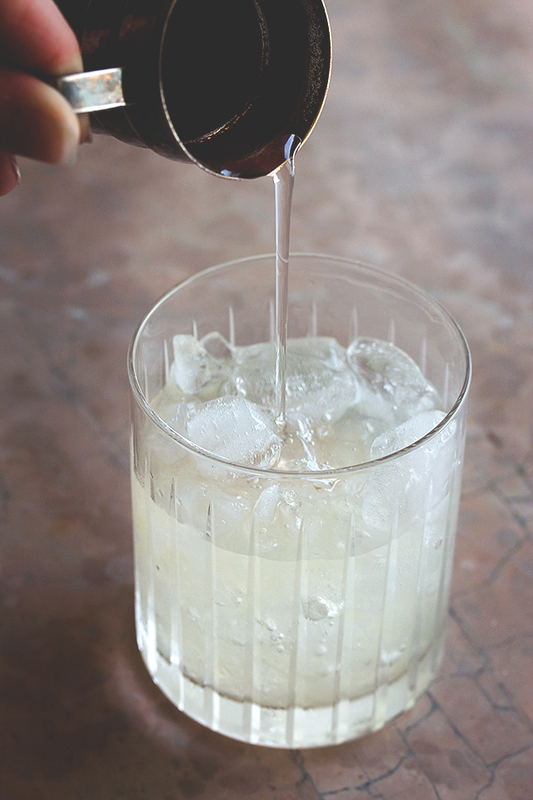 Top off your glass with more crushed ice, then slowly/carefully add the crème de mûre. 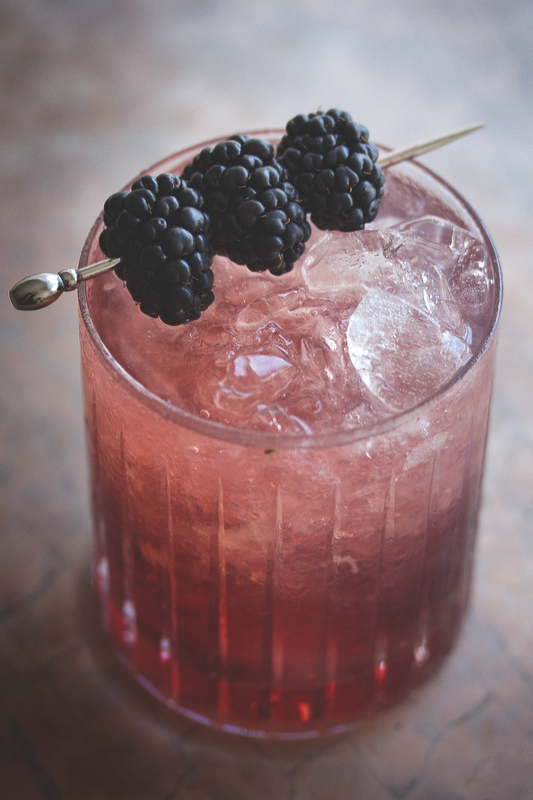 Garnish with a few plump ripe blackberries and serve! Interested in making this and I found this link. Is this you or someone claiming this photo as yours? 3/4 ? Creme de mure? T.? t.? c.? Drops? Sorry if it’s a dumb question but I’ve never used it before! It’s 3/4 oz — thanks for catching that. Post has been updated! I really lovely your photography of the cocktails! We are launching our new gin next week and right now I am preparing a wee leaflet with our perfect serve and cocktail suggestion. I would love to use your photos and would happily credit you too. I particularly love the gin jam cocktail and have had several since reading it! It would fit really well with our launch as we have made goodie bags containing a miniature of our gin and also I have made mini strawberry, rhubarb and rock rose jams. It would be great to have a leaflet showing how to combine both with such fantastic photography. Please let me know if it is possible we can use your pictures? Ummm… yes, please! I’ll take one! These sound amazing, and your pictures and presentation are PERFECTION. 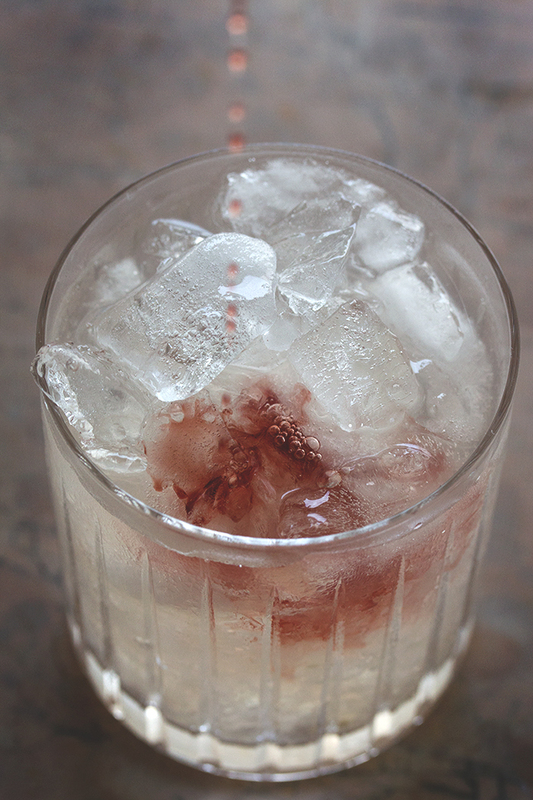 I’m just going to stare at this drink on my screen for the next 10 minutes. Don’t mind me! Wow, so gorgeous. My Sunday could use one! Ohh I wish I can drink tons of these and sleep all day after brunch! Where can I buy such metal sticks for the fruit..online? Lovely cocktail! There is a restaurant here in Atlanta that uses crème de mûre in their Bellini’s with blackberries..it’s an amazing drink..so I know this one is just as incredible. Umm yeah! These are so pretty! This cocktail is gorgeous! Pinned! 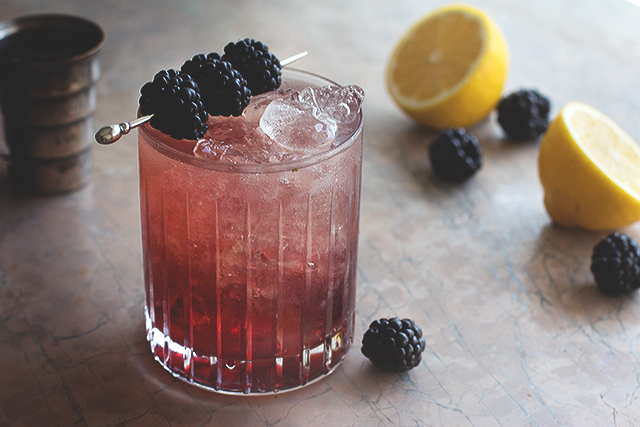 I am completely and utterly obsessed with your cocktail photos. I mean, seriously. Not to mention this stunning drink! Looks like a refreshing cocktail! Can’t wait to make it! Oh, hella I can’t have one these soon enough! Love the photos too. I was literally showing Naomi this as you tweeted it to her. Absolutely amazing and this needs to get made here quickly. 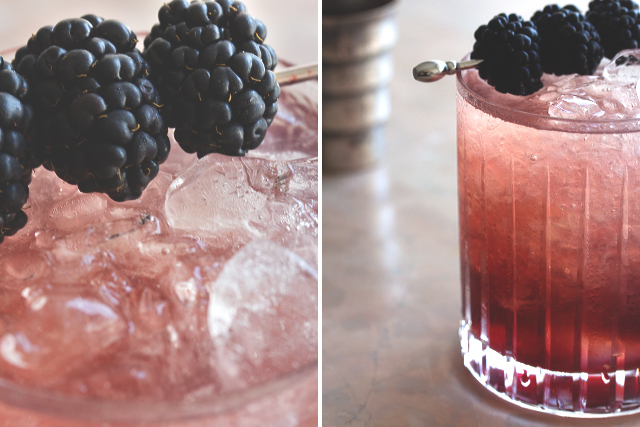 We can’t keep blackberries enough blackberries in the house between smoothies and meals. Love this! Haha, that’s awesome! Cheers guys!! I know it will have to wait a bit, but it’s worth it. Another gorgeous cocktail! I can’t wait to try this with some farmer’s market blackberries! im always soo intrigued by the drinks you make.